It should be lights out in Belgrade: every power grid, water pipe, bridge, road and war-related factory has to be targeted. We will set your country back by pulverizing you. You want 1950 ? We can do 1950. You want 1389?1 We can do that, too! We need to study how to degrade and destroy our adversaries' abilities to transmit their military, political, and economic goods, services and information. Infrastructures, defining both traditional and emerging lines of communication, present increasingly lucrative targets for airpower. [The vision of] airmen should focus on lines of communications that will increasingly define modern societies. Befitting its hegemonic status currently, one state—the United States—currently dominates the practice of state-backed infrastructural warfare. Whilst it would be an oversimplification, it is possible to argue that the geopolitical and military strategy currently being developed to maintain the United States' power as a global hegemon rests on a simple, two-sided idea. On the one hand: develop information-technology-based networked capabilities of control, surveillance and targeting to a level which allows attempts at globe-spanning dominance based on a near-monopoly of space and air power. This is being termed "network-centric warfare" and the "Revolution in Military Affairs" or "RMA" (see Harris 2003; Dillon 2002). On the other: develop the tools and technologies that can disconnect, demodernize, and immobilize adversary societies at any time or place deemed necessary. Such a transformation in US military doctrine is extremely contested—especially after the disastrous occupation of Iraq (Harris 2003). It involves complex institutional politics within the vast array of military departments, political agencies, and defence and media industry groups involved. And care must be taken not to exoticize the transformation as science-fiction (as, arguably, Paul Virilio has often done—see, for example, Virilio 2002). But the combination of the near informational and infrastructural omnipotence of US forces, and the systematic demodernization of adversary forces (and, often, societies)—particularly those in the United State's key geopolitical target areas of central Eurasia—is a central axiom of the RMA. Underpinning this double-edged strategy is the notion of the "enemy as a system." This was devised by a leading US Air Force strategist, John Warden, within what he termed his strategic ring theory (1995). This systematic view of adversary societies, which builds on the "industrial web" theorizations of US air power strategists in World War II, provides the central US strategic theorization that justifies, and sustains, the rapid extension of that nation's infrastructural warfare capability (Rizer 2001). The theory has explicitly provided the basis for all major US air operations since the late 1990s. "At the strategic level," writes Warden, "we attain our objectives by causing such changes to one or more parts of the enemy's physical system" (1995). 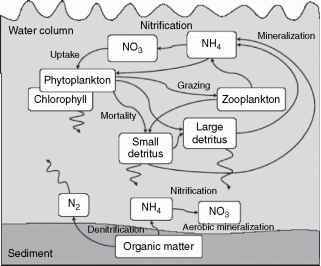 This societal "system" is an attempt to portray the socio-natural constructions, and metabolisms, of urban life which actually sustain national geopolitical power. This is done so that these constructions can be systematically demodernized in the projection of aerial, geopolitical power. In Warden's theory, each enemy societal "system" is seen to have five interconnected parts or "rings." These are the leadership or "brain" at the centre; organic essentials (food, energy, etc. ); infrastructure (vital connections like roads, electricity, telecommunications, water etc. ); the civilian population; and finally, and least important, the military fighting force (Felker 1998) (see Figure 15.1). Rejecting the direct targeting of enemy civilians, Warden, instead, argues that only "indirect" attacks on civilians are legitimate. These operate through the targeting of societal infrastructures and urban metabolisms—an alleged means of bringing intolerable pressures to bear on the nation's political leaders. This doctrine now officially shapes the projection of US aerial power and underpins the key US Air Force Doctrine Document—2-1.2—published in 1998 (USAF 1998). day campaign, only 3000 civilians died directly as a result of the attacks, the lowest number of deaths from a major bombing campaign in the history of warfare" (2001:10). However, he also openly admits that—as we shall soon discuss—the United State's systematic destruction of Iraq's electrical system in 1991 "shut down water purification and sewage treatment plants, resulting in epidemics of gastro-enteritis, cholera, and typhoid, leading to perhaps as many as 100,000 civilian deaths and the doubling of infant mortality rates" (2001:1). The US Air Force perspective is that when attacking power sources, transportation networks, and telecommunications systems, distinguishing between the military and civilian aspects of these facilities is virtually impossible. [But] since these targets remain critical military nodes within the second and third ring of Warden's model, they are viewed as legitimate military targets...The Air Force does not consider the long-term, indirect effects of such attacks when it applies proportionality [ideas] to the expected military gain. Perhaps the real answer is that by declaring dual-use targets legitimate military objectives, the Air Force can directly target civilian morale. In sum, so long as the Air Force includes civilian morale as a legitimate military target, it will aggressively maintain a right to attack dual-use targets. In 1998 Edward Felker—a third US air power theorist who, like both Warden and Rizer, is based at the US Air War College Air University—further developed Warden's model. 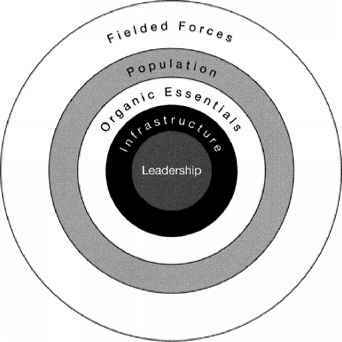 This was based on the experience of "Desert Storm", and drew on Felker's argument that infrastructural networks, rather than a separate "ring" of the "enemy as a system", in fact pervaded, and connected, all the others to actually "constitute the society as a whole" (Figure 15.2). "If infrastructure links the subsystems of a society," he wrote, "might it be the most important target ?" (1998:20). 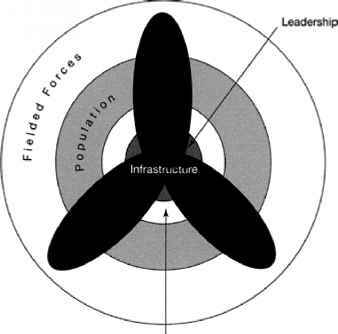 Figure 15.2 "A new model for societal structure": Edward Felker's adaptation of Warden's Five-Ring Model (see Figure 15.1), stressing the centrality of infrastructural warfare to post Cold War US airpower doctrine. By constructing linear, and non-linear models of the "cascading" first-, second-, and third-order impacts of destroying key parts of the networked infrastructure of an adversary society, US military planners have started to develop a complex military doctrine underpinning the extension of US infrastructural warfare. This centres on organized, systematic demodernization not just of the military forces of those deemed to be enemies, but of their civil societies as well (Patterson 2000; see Table 15.1). Indeed, US military analysis here is now concentrating on finding the "tipping points" in critical infrastructure systems that will lead to the non-linear, spiral effects that will most rapidly induce complete, societal chaos (Felker 1998). Whilst the abstract theorization of doctrine and tactics outlined in this section are revealing, the centrality of infrastructural warfare to emerging US geopolitical strategy can only be fully understood when specific case studies are investigated. In what follows the war-sanctions-war experience in Iraq between 1991 and 2004 is used to demonstrate the devastating impacts of this US military doctrine of systematic demodernization on the poor, urban societies that are unlucky enough to fall in the cross-hairs of US military intervention or invasion.